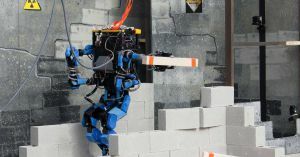 The Google parent’s bipedal robotics projects tripped over its own shoelaces. Alphabet just kneecapped its own bipedal robot research division. Now, Nikkei reports, Alphabet — that’s the parent company behind Google, Waymo, and DeepMind — will dissolve Schaft, the bipedal robotics company that Google purchased back in 2013. This news comes after Schaft employees reportedly protested the company’s pending sale to the SoftBank Group, which had been announced last year. After the sale fell apart, Alphabet decided to cut the program altogether. Schaft workers will be relocated or given career assistance. Since being acquired by Google, Schaft largely kept its works under wraps. But its main project was developing two-legged robots that could walk and balance to rival those built by Boston Dynamics. Schaft’s problems seem to have began when Andrew Rubin, who created Google’s Android and headed the company’s robotics division, left the company — or, more specifically, was handed a $90 million golden parachute and positive PR after an employee accused him of sexual coercion — in 2014. With Rubin gone, Nikkei reports, Google (which founded Alphabet in 2015) began scaling back its previously award-winning robotics division and prioritized its other research divisions. It’s good to see Google dealing with tangible repercussions in the form of lost business, at least indirectly, for its role in covering up sexual assault allegations against one of its executives — a revelation that spurred massive walkout protests among Google employees.